I’m back again for my second semester working on the Langford Green Roof Project! It has been an awesome experience to be a part of this while watching the plants grow and new ideas transform. I really have not got to do too much yet this semester as weather has been bad and I was in Costa Rica for a week, but weather is supposed to be getting better so hopefully next blog I will have more to report. Zane and I will also be presenting a poster at Student Research Week after Spring Break which should be a very rewarding experience. I will be sure to get pictures for my next blog! My first day back on the roof was really cool to see. I assumed with the weather being so cold over the winter break that most of the plants would not fare so well but I was thankfully mistaken. Many of the plants grew very well on the roof modules. The lettuces and herbs did very well (except for the bell pepper basil, all of that died out for some reason), especially the parsley. I think a roof of parsley and mint would grow exceptionally well here in Texas year round and would create a beautiful green garden that can be used for cooking also! 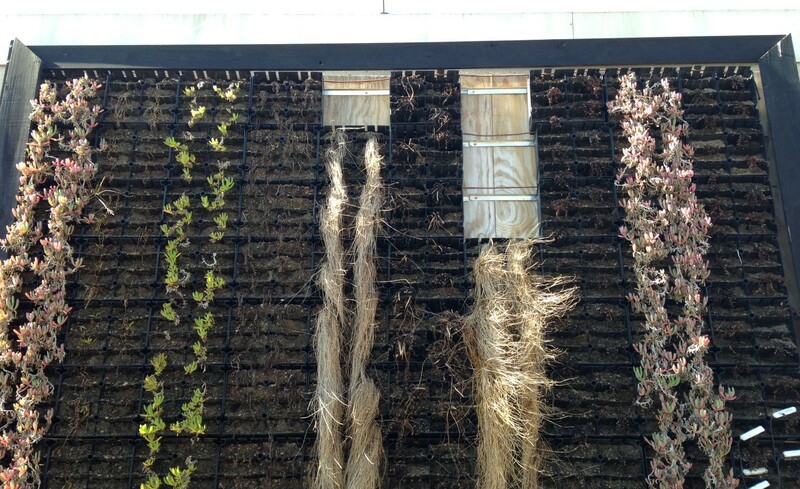 The living wall was disappointing, however. Mostly everything died out or is looking very bleak, with exception to the garlic and shallots which seem to be doing fairly well. I am hoping some of the mint recovers and grows back, but only time will tell. 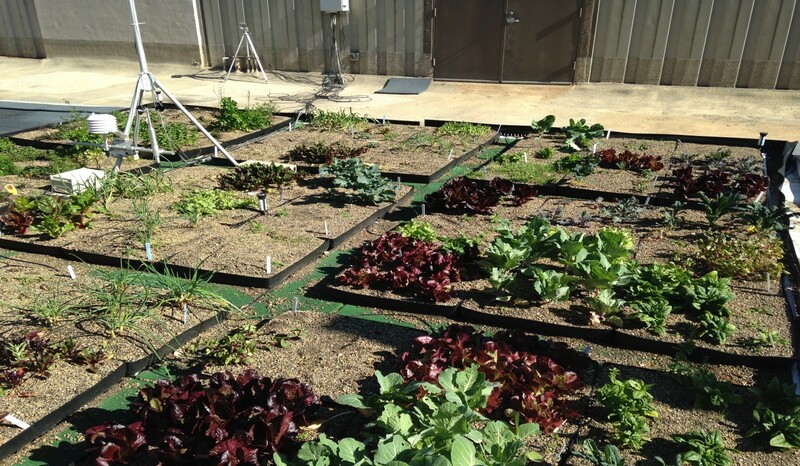 Herbs – I think we should plant more of the herbs that did well (parsley and mint) and I think we should also try cilantro and dill, both of which grow very well at the Howdy Farm on campus and I would be curious to see if they do well on the roof also. Broccoli – I know we planted some in the fall but I am curious to see if it would do better in the spring as broccoli likes direct sunlight (which there is plenty of on the roof) and has a moderate maturity rate. 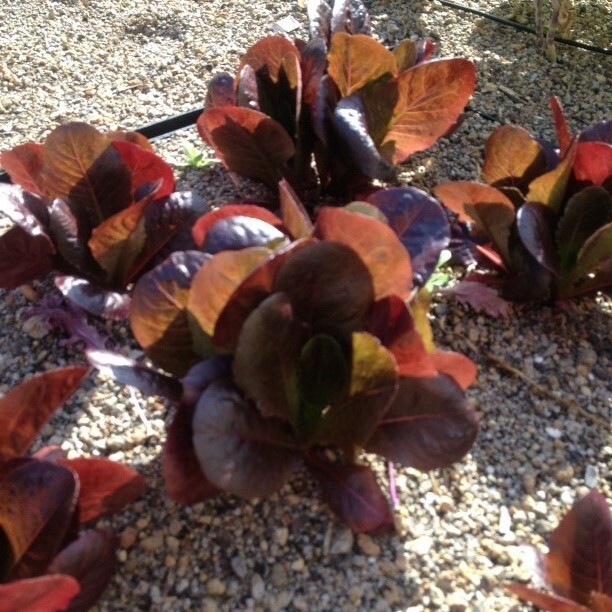 Cabbage – With how well the lettuces did, I really would like to see how cabbage fairs. However, cabbage has a much longer maturity rate so I am not sure if that will affect the decision. Bush beans – These mature quickly and I think they would be really cool to try and grow. Lettuce and spinach – These did well so I think we should try them again in the spring to see if they grow well during this time also. Below are pictures from the first day back on the roof! 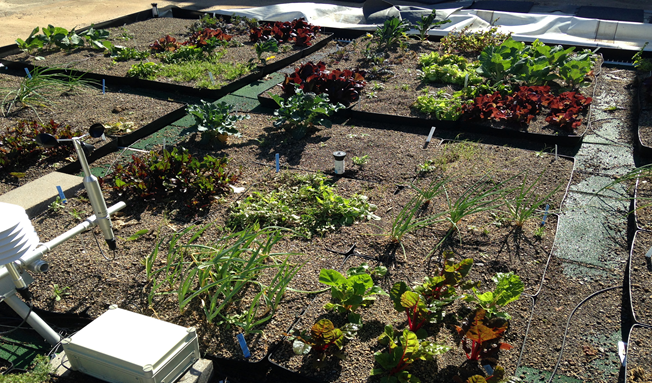 The first week of class we began harvesting and weighing vegetables that were growing in modules on the roof. I was surprised at how healthy and plentiful all the vegetables were. There was a variety of crops too, including Italian parsley, cilantro, spinach, and even turnips! It was interesting to notice though how the crops on the ground had done so well; however, the plants on the wall were all dead with an unknown specific cause. It is possible that the plants on the wall could come back after winter but little growth was noticed throughout the weeks even when we trimmed the ends of the plants in order to spur new growth. It could also be due to the restricted space the plants are given as they are seated in small pockets along the roofs walls or due to a lack of or surplus of moisture. We hope that over the semester to identify what the problem is and correct it in order to ensure better and healthier plants that can live year round. Now the planning remains as to what plants should replace those that are dead. After an excellent presentation by Professor Dvorak, who introduced me to the famous botanist Patrick Blanc, I could visualize what our goal was on the top of the Langford Architecture building. We need to find plants that are evergreens and can live all year round and find crops to grow on the modules that rest on the ground of the roof as opposed to the other plants that grow vertically along the wall in pockets. Some of the edibles I would like to plant in the ground modules are rosemary, tomatoes, bell peppers, basil, and cilantro. Howdy. My name is Ivan Mendoza. I’m an undergraduate senior in Horticulture. I am taking this greenroof experimental course so that I can see which plant species thrive in this area of Texas on green roofs. As a perspective landscape architecture student, I’m hoping I can use the knowledge I gain from this course and hopefully apply it to future landscape and commercial designs. 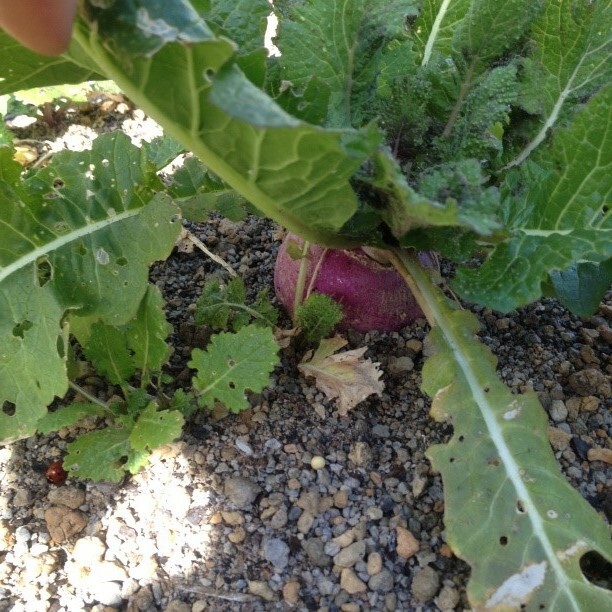 When we started this spring semester, we had edibles in place on modules which were planted last spring. We also have 3 living walls in place. 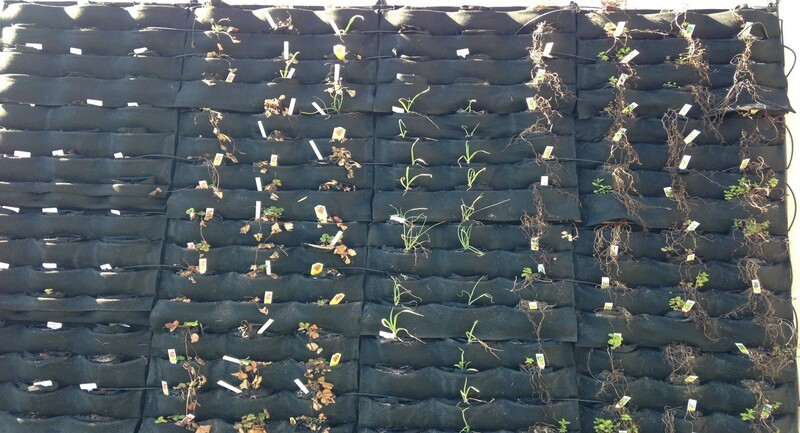 The first living wall has succulents and sedges in place, the second has strawberries, mints with some other perennials, and the third has a mixture of perennials. The first day we recorded inventory of the number of edibles for each species that was still alive on each module. The majority of the edibles that were planted last spring did fairly well, except for Basil (Bell Pepper), Chinese cabbage (Rubicon), Radish (Easter Egg), Turnips (Hakurei) and a couple of varieties of other species. The growth size of the edibles that did well varied across the modules due to external factors (light, water, wind, etc.) 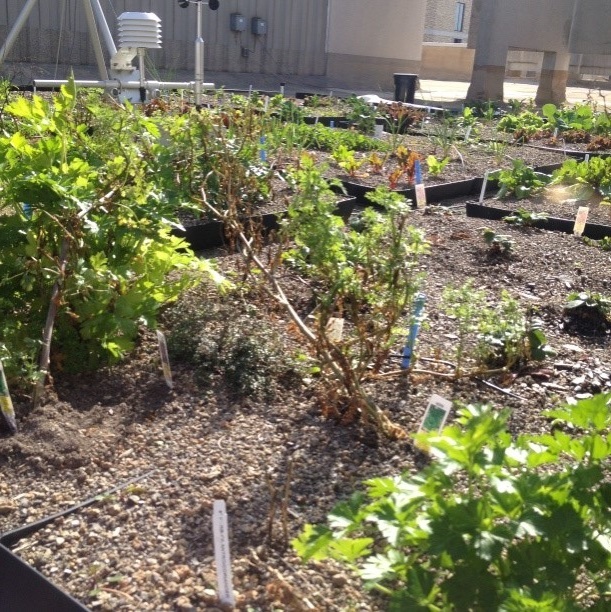 Following, we harvested the edibles to have them regrow new foliage and recorded the data. We have also cut any flowers that have been growing on the edibles so that they focus their energy more on growing. Slow release fertilizer has also been applied on these edibles which has helped them grow as well. We have been focusing on which edibles we are going to plant later this spring as well as the perennials we need to replace on the living walls (especially living wall 3). We notice that rosemarinus officinalis, ficus pumila, and artemesia “powis castle” are some the species regenerating growth on living wall 3. We have been trying to figure out why the other perennials on living wall 3 have not done so well. We do not have any information collected to try and narrow down the problem. We will come up with a list of edibles and perennials to plant on the modules on the roof and on the living walls. This class has been very interesting so far and I am excited to see what our proposed plant species do in the future.